The new Twenty Thirteen WordPress theme is now in the WordPress Core, Mark Jaquith (The Lead WordPress Developer) posted. The Twenty Thirteen team has completed the design/development phase and handed over the theme for testing. If you are curious about Twenty Thirteen project, then visit WordPress core to test it. As we know that Twenty Thirteen will come with upcoming WordPress 3.6 as a Default theme, the new version of WordPress especially focusing on editorial workflows, revisions, autosave, editing, post formats along with few other areas that need improvement. You can read about upcoming WordPress 3.6 on What’s Coming Up With WordPress 3.6. The aims of the Twenty Thirteen WordPress theme are to provide and focus on blogging as well as great support for post formats because blogging is the important part of almost all online business websites and post formats getting attention on the backend in WordPress 3.6 which is boasting bright, bold and beautiful colors, perfect for a personal blogging site. If you like Genesis Framework and its child theme then this Twenty Thirteen theme look similar because it uses post formats and a full-width layout by default. Although Color is a personal choice and I think WordPress core developers design this theme to keep in mind that many users will want to customize the home page, blog page and different colors for each post format selected. You can customized the post format by changing the background, font size, and style. Header is the most prominent part of all blog and websites, there is choice of three default header images (Diamonds, Star and Circle) to present this part with fixed width. In this most important part, there are two default widget areas as Widget area for Sidebar and Footer Widget Area. The default pagination is really improved in this theme and it looks pretty cool with customizable colors. The Twenty Thirteen WordPress theme is a Responsive theme with cross browser consistency and change the images for posts, comments, and widgets are according to the mobile and Browser, because of Responsive design the style sheet contain the heap of CSS code for mobile responsiveness and cross browser usage. With a Twenty Thirteen theme that supports Post Formats, a blogger can change how each post looks by choosing a Post Format from a radio-button list. More about Post Formats. Search Box is very nice with expandable box and you can customize Search Box with Google custom search for higher accuracy. 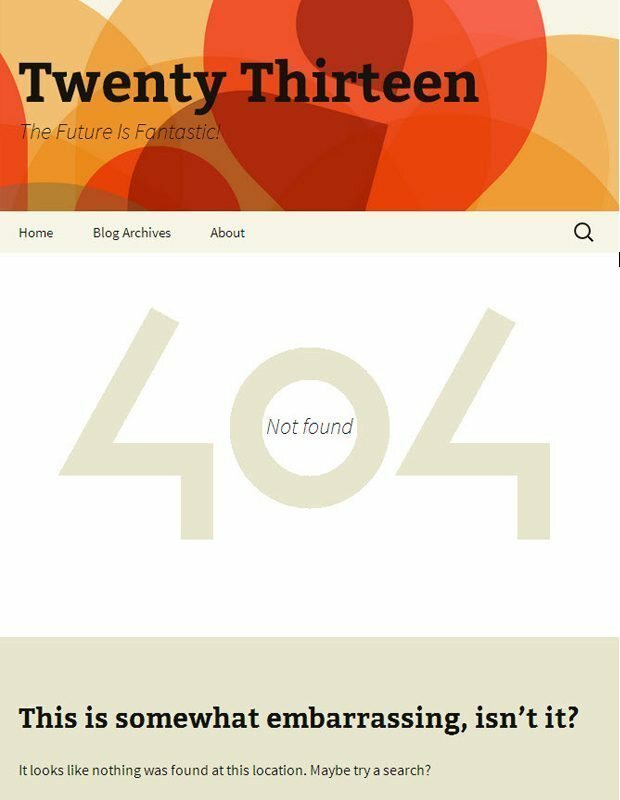 Twenty Thirteen WordPress theme has a good Error 404 page because it is perhaps as important as having great contents. All is not lost. If your visitors encounter an error, why not be a helpful WordPress site administrator and present them with a message more useful than “NOT FOUND”. Twenty Thirteen has been released as of today and can be downloaded directly from its WordPress.org page. The best way to install this theme is to navigate to WordPress Dashboard >> Themes >> Add New Theme. There you can search the theme and install it. If you like Twenty Thirteen WordPress theme and already have customized it for your blog or website mention it in the comments section below.